The United States has deported a record number of unauthorized immigrants and other removable noncitizens in recent years. More than 4.5 million noncitizens have been removed since Congress passed sweeping legislation in 1996 to toughen the nation’s immigration enforcement system. The pace of formal removals has quickened tremendously, rising from about 70,000 in 1996 to 419,000 in 2012. This report analyzes the current pipelines for removal and key trends in border and interior apprehensions, deportations and criminal prosecutions. With the Department of Homeland Security (DHS) in the midst of a review of its deportation policies to see if they can be conducted “more humanely,” the report also examines the policy levers the Obama administration has to influence deportation policies, practices and results. A fundamental shift from a deportation system focused on informal returns (voluntary return and departure) to one focused on formal removals, which have more severe consequences for those who are repatriated. Major expansion in the use of nonjudicial removal procedures such as expedited removal and reinstatement of removal, in which immigration enforcement officers rather than immigration judges make deportation decisions. Escalating criminalization, with a rising proportion of those apprehended at the Southwest border charged with immigration-related criminal offenses. 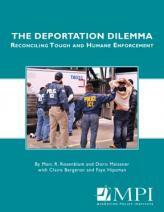 The report explains that three factors have been the key drivers of major changes in deportation outcomes during the last two decades: new laws that expand the grounds for removal and speed the removals process; sizeable and sustained increases in immigration enforcement personnel, infrastructure, and technology; and operational and policy decisions by three successive administrations to shape enforcement outcomes. The report describes the actual state of U.S. immigration enforcement: Who is being deported and where and how are they being apprehended? It also explores how the current administration is carrying out its enforcement mandates. The Obama administration inherited—and expanded upon—unprecedented capacity to identify, apprehend, and deport unauthorized immigrants. Nearly as many people were formally deported during the first five years of the current administration (over 1.9 million) as during the entire eight years of the prior administration (2.0 million). What is new is that the Obama administration also has implemented prosecutorial discretion policies to focus enforcement efforts, even as the overall scope of enforcement has grown. These policies provide guidelines for exercising discretion not to deport certain people in cases that are outside established priority categories. Overall, enforcement at the border and within the United States show sharply different pictures. At the border, there is a near zero-tolerance system, where unauthorized immigrants are increasingly subject to formal removal and criminal charges. Within the country, there is greater flexibility, with priorities and resources focused on a smaller share of the population subject to removal. Such differences are consistent with the different goals and circumstances confronting border and interior enforcement. But the impacts of these differing systems have begun to converge, raising increasingly complex questions and choices for policymakers and the public. The research presented here highlights the deportation dilemma: that more humane enforcement is fundamentally in tension with stricter immigration control; and that a more robust enforcement system inevitably inflicts damage on established families and communities. F. DHS Enforcement Priorities and Prosecutorial Discretion: How Have They Worked?